Speak softly and carry a cool umbrella. Rain brings out the best in some people. In others it dampens not only the mood, but the entire outlook on life. Their loss. Perhaps it’s the plant person in me, or the plant that I am, but I’m a big fan of rain. Even the kind they have in Seattle, which doesn’t quite measure up to my definition of rain most of the time, except for the undeniable wetness of it. People who only visit Seattle in the summer during the annual raincation, when the sun hardly bothers to set for about twelve weeks, sometimes come away with the mistaken notion that Seattle’s reputation for rain is a bum rap. Not true. It is, in fact, a very accurate rap, for nine months of the year. However, the kind of rain they have is subtle. For one thing, it barely makes a sound. There’s never thunder, far less the kind of drilling, thrashing gouts of monsoonish excess that make strong umbrellas wilt and weak ones blow away into the overflowing gutters. In Seattle, where the weather forecasters have a hundred ways to describe rain, the typical rain doesn’t so much fall as sort of mist from cloud to ground, wetting everything in its path. Newbies sometimes think this means they can walk about in it without an umbrella, perhaps mislead by the way many Seattle natives eschew umbrellas out of a sense of regional pride. The true mossback needs no umbrella. In my current Washington the weather makes quick work of such ridiculous attitudes. It’s raining? Grab an umbrella. Grab two. You know you’re going to leave one on the metro sooner or later. The thing is, for all Seattle’s vaunted reputation for rainyness, D.C. has it beat six ways to Sunday in terms of quantity, dramatic special effects, and steam-heat inducing abandon. I love it. I love the thunder, the sudden darkening of the skies, the puddles, the hiss of tires on the streets, the mad dash for cover when the clouds open up on a whim. Mother Nature can be such a tease. 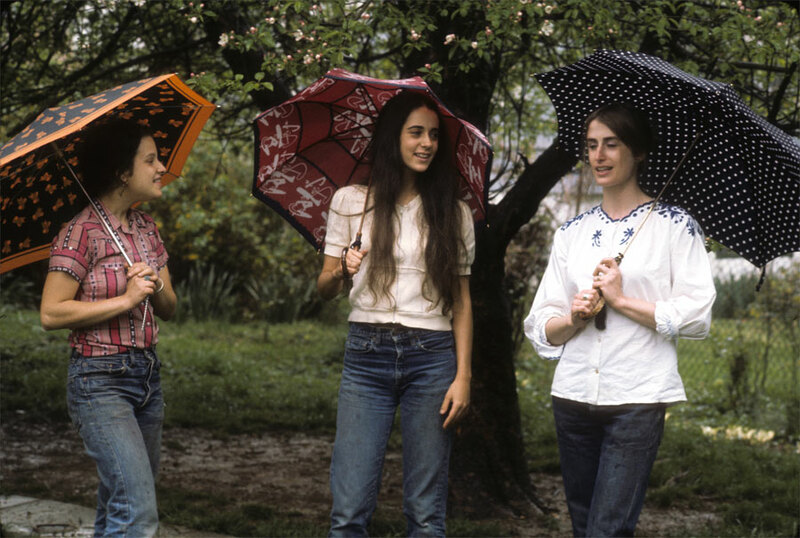 One of my most memorable D.C. rain experiences took place many years ago when I was a carefree hippie. I didn’t own an umbrella at the time, in much the same way that I didn’t own a vacuum cleaner or a television. I was a free spirit, riding my bike to work in the rain, sans helmet. I feel lucky to have survived my own lunacy. But I digress. The day I became the proud owner of an umbrella I had gone downtown with my girlfriends for some reason which escapes me now. We had Chinese food at some point. And I know we went in the now-vanished button store, which actually sold buttons and nothing but buttons, back in the days before mega-chains took over whole blocks. Anyway, as we were leaving the button store, or it could have been the Chinese food place—memory is sketchy on this detail—the weather took a sudden turn to the King Learish and the rain, of which there had been no hint two minutes before, came down like a wet velvet curtain. We darted in the first store we saw, which, as fate would have it, was an umbrella store. No lie. This store sold umbrellas and nothing but. Well, sensing that destiny was at work, we each selected an umbrella to match our personalities at the time. You can read as much into this process as you like. Just wait until you are faced with the task: describe yourself as an umbrella. We laughed and joked and tried on umbrellas and eventually left the store slightly poorer but three umbrellas richer. I still have my umbrella from that happy rainy day, though I really couldn’t tell you why I chose a polka-dot one. I think I was going through a phase. My friends both lost their umbrellas as years went by, but they are still my friends, which are better than any umbrella anyway. Rain or shine, a smile may not be an umbrella, but if you find someone who laughs at the same things you do, you’ll never mind a few raindrops on your head. Nice! Those other girls look familiar, but names…? Miss Helm and…her :-). I think y’all made excellent choices! After I left the East, to my mother’s home town of Lufkin, Texas, I visited my brother and wife in NYC. Armed with my first credit card (and a well-paying job, back in TX), I went a little crazy…can only ‘justify’ it by telling you I still have some of the things I bought in 1985. I bought a gorgeous wooden handled, turquoise fabric umbrella! Over the years, it’s become discolored and one of the wooden end pieces is lost. But now I’m thinking, with all the “improvements” in cleaning products…maybe. And I could probably sculpt a faux-wood tip. And revive that lovely umbrella…haven’t used it in many years, but I do believe it is riding around in the trunk of my car. Just in case. So glad there is this photograph. And the memories that come tumbling in. Like it was yesterday. Let’s do it again and look at the pictures in thirty years or so.